Now here's an opportunity to make your CD collection sound even better than ever – without the aid of a CD player! And it's all thanks to the future-proof Linn Majik DS-1 digital streaming amplifier, making its debut in the wake of Linn's vision of a future in which CDs are stored on networked hard disks and replayed by digital streamers. Alternatively, the dedicated music fan can dispense with physical storage media entirely and download their albums (preferably at above-CD resolution) from internet sites that provide better-than-MP3-format files – one of which is Linn itself. Once downloaded, storage can be taken care of on the optional RipNAS combined CD-ripper/Network Attached Storage unit, with a hard-disk capacity of one terabyte (£894). I found, however, that when I compared it with my Netgear Storage Area Network, the rips weren't as satisfactory, so I regularly fed the DS-I with this alternative source. You could just as easily use a PC with UPnP delivery software, or a NAS unit if you preferred. The Majik DS-I is fundamentally a DS digital streamer combined with an analogue/digital preamplifier, as well as the Chakra 90 watts per channel power amp, all of which are powered by Linn's fifth-generation Switched Mode Power Supply, the Dynamik (the name Majik actually signifying Linn's bronze-level product, the other been silver-level, Akurate and the gold-level, Klimax models). The Majik DS-I can be controlled by software on a PC or a handheld device such as the iPod Touch. I used the open-source Kinsky Desktop software on a laptop. In truth, it isn't wonderful, but show me a player/server/streamer software today that is. Kinsky Desktop is no worse than any other front-end although my reaction to it is wholly personal and subjective. The preamplifier section of the DS-I offers both analogue and digital inputs for system expansion and there are both pre-and line outs for use with external amplifiers or analogue recorders, with S/PDIF and Toslink connections providing digital outputs. Analogue input is configurable: it comes as a moving magnet phono input, but can be dealer-converted to moving coil or line-level. The power amplifier stage is a 90 watts per channel Linn chakra design that had no problems whatsoever, driving either the Linn Majik 109 speakers or the NEAT Petite SX compacts – the latter I used throughout the review period simply because I know them well and preferred their performance. The network side of the install is where things can become a little tricky. Linn supplied the review sample with its recommended third party network components, which is a methodology that reduces the variables and so decreases the likelihood of incompatibility problems for its installers. It likes to see the DS-I attached to its own sub-net rather than simply integrated with an existing network. Indeed, this is probably the best way to do things in most situations, but it wasn't ideal with my set-up where my network storage (a SAN (Storage Area Network box)) and the server to which it is attached were on a different network segment. For a typical home network this should not be a problem. I am not so certain, though, about Linn's insistence on including a dedicated ethernet switch, a discrete router and a separate wireless access point (the Wi-Fi is only for control purposes: all the music travels on cat5 cable). According to Linn; this is better than using an all-in-one device, because each has its own processor dedicated to one task and that provides greater performance. That, I would argue, might be true but it is hardly relevant when all you are doing is sending one music stream over a length of Ethernet. I linked my own network to the Linn sub-network through a truly ancient, dusty, 10-megabyte hub and did not detect any glitches or degradation in the musical performance of the system while material streaming from my server. I like the clean lines and styling of the DS-I and I had absolutely no reservations about its construction. It is a sturdy, weighty unit and its casework is beautifully engineered. There is not a sharp edge on it anywhere. Every edge with which your hands will come in contact is as smooth and rounded as Beyonce's bum. 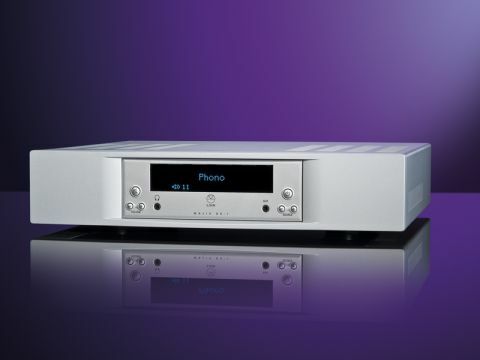 It is important with such 'computerised' hi-fi that it not only functions as a piece of hi-fi, but that it integrates successfully with the host network. In my domain-based system it was none too happy being removed from the Linn-installed sub-net. A few times, everything with a network address and a couple of items without, demanded to be power-cycled and left alone to meditate for five minutes before anything would converse with its neighbours. I began to see the logic in Linn's belt and braces approach to networking, although I would be interested to discover which element, process or combination thereof causes this flakiness. However, Linn is definitely not alone in this respect. The integration and user interface aspects of equipment in this relatively new discipline seem to be dragging their heels way behind the audio performance. The DS-I is not hugely expensive, but it costs more than the NaimUniti, which also features additional facilities such as a CD drive, DAB and FM tuners and isn't quite as fussy about network connections. The Uniti also gets by with just a remote handset and a simple facia-mounted display. The DS-I performs well, though, in hi-fi terms and is particularly noteworthy in a couple of respects: it is a ferocious scavenger of information and its sound is so clean it sparkles. Hi-res downloads from the Linn Records site demonstrated this graphically: the 24-bit/192khz recording of William Carter playing the music of Fernando Sor came across beautifully. Carter's playing was spell-binding and the sound was impeccably realistic and alive, creating the feeling that he was sitting only a few feet in front of me exposing those rich veins of tonal colour and expression from his gut-strung replica baroque guitar. The dynamic gradation evident was incredible and it was easy to hear one string being quietly plucked while another was being sounded more vigorously. Listening to his double-stopping and his use of harmonics during the air O cara armonia from Mozart's Il Flauto Magico op 9, was little short of sublime – both the playing and the hi-fi aspects of the portrayal. The Majik also managed to turn me on to a new, contemporary canadian singer, Dawn Langstroth, whose vocal style and backing band on highwire put me strongly in mind of Aimee Mann, a real favourite of mine. It conveyed Langstroth's similarly economical approach to singing and the powerful lyricism of her song writing, succinctly contrasting her often delicate voice with the robust dynamism of her band. The portrayal of the piano and electric guitar stood out as being especially notable: the piano for its pitch stability and full-bodied tonality on You Don't Want Me and the guitar for its wholly credible leading edge attack on It's All Good. Eventually, curiosity got the better of me and I tinkered with the networking set-up and managed to resurrect the infamous Linn/Naim Axis of the 1980s: I persuaded the Linn DS-I to stream tracks from my Naim HDX. Older readers might appreciate the irony in that role reversal. This, however, afforded me the opportunity to compare the quality of rips made by the HDX and those produced by exact Audio copy on my PC, to those of the less expensive RipNAS. The Majik DS-I is an analytical machine and seems readily to discriminate between good and inferior rips. Not surprisingly, I preferred the first two to the latter. If one were not listening critically then the RipNAS might seem acceptable, although a highly discerning colleague and I both felt that its rips did not appear as involving or exciting: they were just about on a par with those you'd hear through a Mac laptop and an inexpensive DAC, a combination that is fine... for casual listening only. A prime example of this was Academia from the Sia albums. The timing on this track seemed lethargic on the RipNAS rip, while her delivery sounded half-hearted and uninspired. Her phrasing is particularly dextrous on this number, her vocal weaving sinuously around the band's playing to great effect, but this nuance seemed to escape the RipNAS. I also did not particularly enjoy the way it presented the timbre and tonality of her voice, occasionally making it sound nasal and hard. The revealing Majik DS-I deserves a more transparent storage device and is hard to fault in isolation. And if you crave detail above all else, then this might well be the answer to all your dreams. I greatly preferred its performance with hi-res material to that with CD-resolution rips, unless they were sourced from one of my preferred ripping set-ups. The DS-I seems to be an absolute resolution junkie. It has an especially convincing way with classical music that absolutely delighted me, but with rock music, I think it perhaps needs to let its hair down a little, loosen up and have some fun.